The WR Express is designed for a one man operation. It features several operator friendly functions and options including fast removable battery packs, remote control, different types of wheels, height adjustable platform and adjustable handles. 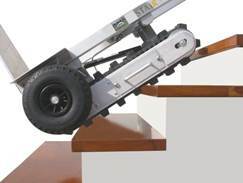 The WR Express reduces the safety risks during a stair move and minimizes the physical burden on the operator. 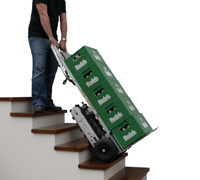 The StairRobot SR450 is a powerful yet easy to handle item of moving equipment. 4 batteries are fitted in series to provide a 24 volt output. A integrated led battery indicator on the control display makes it possible to monitor the batteries. The SR 450 comes with a 220V 0r 110V / 24 charger (3 amp), charging time with batteries fully discharged 3,5 hours. When the batteries are fully charged the charger will automatically turn into a trickle mode. For charging the SR 450 on a van or truck an optional 4 amp 24V booster/charger is available which makes it possible to charge the SR 450 between jobs. 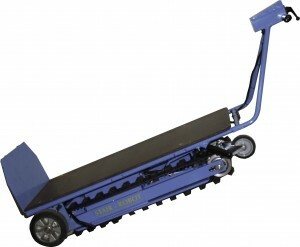 heavy duty dolly is available for handling long and bulky objects. 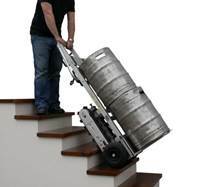 The dolly is used to transport the (loaded) SR 450 to and on the stairs and is used at the landing. 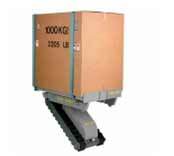 The stairrobot SR 1750 HE is designed to carry unit loads weighing up to 1000 kg up- and down stairs. 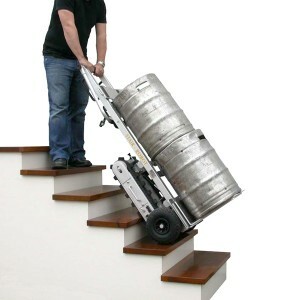 The accessory equipment, stair approach ramp, manoeuvring dolly and the turntable have been designed to assist the movement up to and onto the stairs and the take off from the top and journey to the final destination. The stairrobot SR 1750 HE is equipped with a hydraulic levelling platform which makes it possible to transport fragile loads in horizontal position throughout operation. The stairrobot SR 1750 HE not only reduces the number of men required for a professional move but also greatly reduces the hazards involved in a traditional stair move. Driving power is provided by a minimal noise, single-phase AC motor with thermal cut-out and is transmitted to the drive-axle by a built-on worm-gearbox. The worm-wheel reduction forms an effective brake if the current is interrupted for any reason. The hydraulic levelling platform is operated by a single-phase, low noise AC motor with thermal cut-out. A hydraulic pump is built directly onto the motor. The lowering speed of the platform can be adjusted by the descent-adjuster. 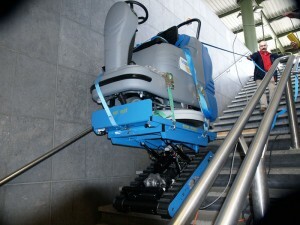 With the additional winch and ramp a load can be hand-pulled onto the stairrobot with a minimum of effort. The robot is controlled by a low voltage (24V) manually operated 4-button switchbox connected to the stairrobot with a 2 meter remote-control cable.